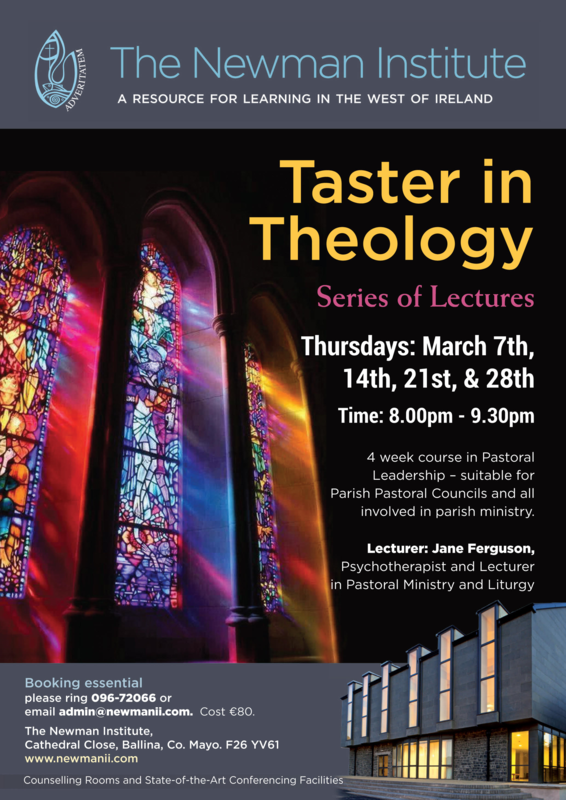 A four week course in Pastoral Leadership will be held at the Newman Institute, Ballina on Thursdays, March 7th, 14th, 21st, and 28th from 8.00pm to 9.30pm. The course will be delivered by Ms. Jane Ferguson, Psychotherapist and Lecturer in Pastoral Ministry and Liturgy. Jane has extensive knowledge and expertise in this area and many years of experience working with Parish Pastoral Councils and those involved in ministry. Suitable for members of Parish Pastoral Councils, Parish Finance Committees, those involved in various church ministries and all who have an interest in developing a deeper understanding of their role in their local parish.